Flexi-Grip® roundslings are lightweight, with superior flexibility, to conform to the shape of the load. Tuffy® Products round slings are constructed from USA made synthetic fibers and are fabricated in our Hurst, TX branch. Roundslings are made using polyester load yarns and seamless tubing with no stitched edges to become snagged. Roundslings are pliable and offer some protection to fragile and odd-shaped loads. Sliding sleeves and synthetic armor pads are also available to protect the roundslings against abrasion damage which can be caused by contact with load edges. 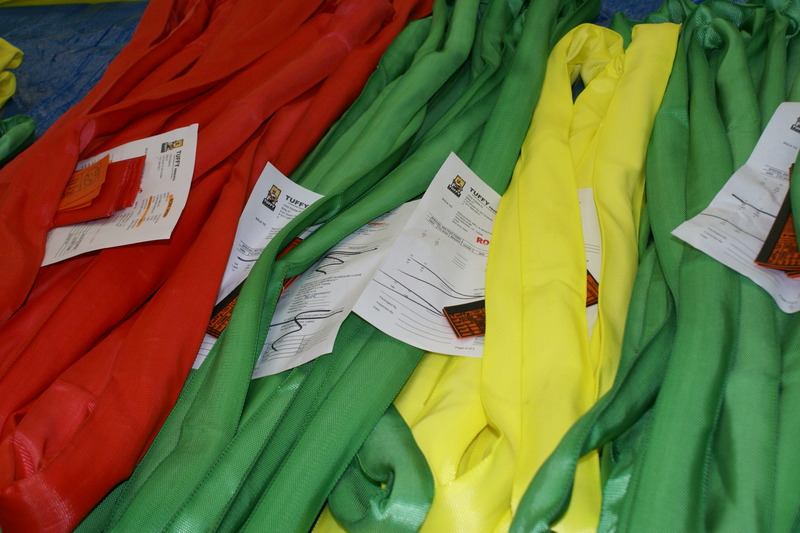 The polyester tubing is color coded for size reference and each roundsling is equipped with a high visibility, heavy duty laminated vinyl tag noting name or trademark of manufacturer, manufacturer's stock number, rated loads for the types of hitches used, core & cover material, and number of legs if more than one is present. Combine model, length in feet, and type, specify if eye & eye type or hooks required. Replace the "*" in the part number to specify end fittings. - EEFG- bride made in eye and eye type. Sleeve used will be black or grey color. - EEFGSH- Bridle made in eye and eye type with sling hooks. Sleeve used will be black or grey color.